October 7, 2013, 4:15 PM · During the run-up to my recent visit to Japan and the country's Disney and Universal theme parks, I became concerned about the language barrier. I wasn't really worried about finding my way around. In the past year, my wife and I had traveled to China, Vietnam, Cambodia and Indonesia with minuscule knowledge of the languages spoken there and we had bridged most of the language gaps with patience, hand gestures and a bit of educated guessing. Given those experiences, I was more concerned about how Japanese theme parks would feel. While the U.S. Disney and Universal parks certainly offer excitement, there's also a degree of "comfort food" to my trips there. Maybe I sound completely ridiculous, but going to the American locations of these parks can be like visiting old friends. I was unsure exactly how I'd feel about my old friends speaking, or singing, a new language. What we discovered was that it was a little weird, often hilarious and usually wonderful. Getting around the parks is no problem for those who read English. Both parks at the Tokyo Disney Resort offer maps and time guides in English, which were handed to us upon retrieving our multi-day pass (more English maps and guides were available at Guest Services at each park). We also were handed an English map at Universal Studios Japan in Osaka, and parade/show times were posted in English in a few areas around the park. As far as attractions and restaurants go, most have dominant English language signage, sometimes with a Japanese translation underneath. In order to make areas such as Tokyo DisneySea's American Waterfront feel authentic, the signs are all in English. This means the subtle wordplay found on the land's fake advertisements is lost on most park visitors, although it shows how dedicated Japan's Disney parks are to theming. English will get you around, but it helps to learn a few Japanese phrases before visiting. In order to communicate basic things not just with park employees but also with Japanese visitors, I would recommend learning at least the different forms of greeting ("Ohayo gozaimasu," "Konnichiwa" and "Konbanwa" – depending on the time of day), thank you very much ("Arigato gozaimasu") and excuse me/I'm sorry ("Sumimasen"). If you have the time, aptitude and/or interest, more phrases would come in handy. Throughout our trip, most Japanese were positively tickled that we were making the smallest of efforts and we felt similarly when they would do their best to reciprocate in English. It's amazing that you can have a heart-warming exchange while simply ordering lunch. The restaurants – whether snack stands, counter service or table service – at Universal and Disney in Japan couldn't be easier to use. All signage is in Japanese and English. Just about everything has a picture and, in some instances, the establishments have plastic food displays to show you what you'll be paying for (something you'll see in restaurants throughout Japan – mmm … plastic sushi). Speak slowly and don't hesitate to point to what you want; most food service cast members/workers made sure that we were getting exactly what we were asking for. Many cast members at the Disney parks spoke enough English to communicate the normal duties of their jobs. If we had a question or problem that required a better command of the language, they were happy to find another cast member with more English language knowledge. In our experience, this was rarely required, and hand gestures along with a friendly smile seemed to do the trick. During our visit, we needed to stop in the Central First Aid location at Tokyo DisneySea with an extremely minor health issue. Our fears that we might not be understood were alleviated the moment the welcoming cast members placed a portable electronic translator on the desk. It was good to know that if we had needed help with an emergency, the language barrier would not have been a hindrance. Because Osaka's Universal park appears to see fewer international visitors, English was not quite as commonly spoken by park workers. That is how we accidentally ended up with a reserved ticket for the "backdrop" version of Hollywood Dream (a happy accident; we just thought we were getting on the forward-moving version of the coaster). On the other hand, because of the lack of foreign visitors, we instantly became a little more "special," with workers handing us freebies and going out of their way to make sure we were enjoying our time at USJ. As I said earlier, amidst the excitement of preparing to visit the Japanese parks, there was a small, irritating voice in the recesses of my brain screaming, "But you're not going to understand anything!" Regardless of how I felt about that, it didn't even turn out to be true. Although many rides contained solely Japanese narration or dialogue (The Amazing Adventures of Spider-Man, 20,000 Leagues Under the Sea, Monsters Inc. Ride & Go Seek), others contained a mixture of Japanese and English. The Country Bears Vacation Jamboree was sung in a mixture of both languages – and yes, "Achy, Breaky Heart" is just as cloying in Japanese. The Haunted Mansion featured Japanese narration, but Madame Leota and Little Leota spoke English, as did the ghouls howling "Grim, Grinning Ghosts." As for "The Little Mermaid" musical show in the Mermaid Lagoon Theater, all of the songs were in English with the dialogue in Japanese. Meanwhile, all of the scallywags sacking the Spanish Main sang and spoke English in Pirates of the Caribbean. Beware of… Star Tours' hitchhiking robots? And then there was a ride with an orientation film in which neither Japanese nor English were spoken. Because Indiana Jones Adventure: Temple of the Crystal Skull is set in an Aztec temple in South America, our guide is the Spanish-speaking Paco (who sort of looks like Jack Black's non-union Mexican equivalent). We weren't totally in the dark – the video is subtitled in English and Japanese as Paco bids us, "Adios!" In three instances at the Disney parks, attractions provide foreigners with a handheld screen that translates the Japanese into English or Chinese. At the Magic Lamp Theater and Mermaid Lagoon Theater at DisneySea and the Enchanted Tiki Room: Stitch Presents Aloha e Komo Mai! at Disneyland, you can request this subtitle screen when you join the queue. The devices lagged just a bit, but performed well. In the cases of the Magic Lamp and Stitch, we enjoyed the dialogue-heavy shows a little more for knowing exactly what was going on. Two other DisneySea attractions offer a different sort of English enhancement: souvenir fliers written in English. When we queued up for Sindbad's Storybook Voyage, a cast member raced to grab a couple of these small but colorful pieces of paper that listed the English lyrics to Alan Menken's "Compass of Your Heart" – the theme that plays throughout this exuberant musical dark ride. 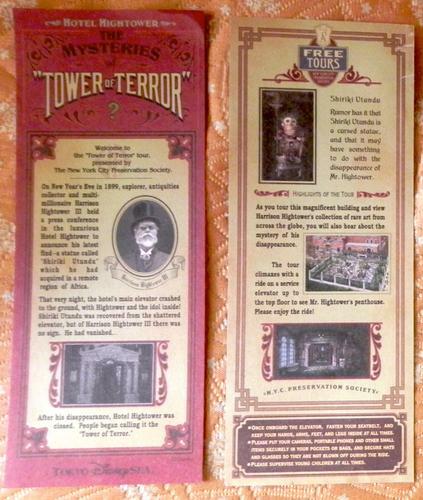 Another intricately designed sheet was available at the entrance to the Tower of Terror, which explained the backstory that was recited by the ride's "tour guides" before the pre-show. The sole instance where the language barrier proved an insurmountable impediment was at DisneySea's Fortress Explorations (a free-roaming area that's sort of like Tom Sawyer Island for the Renaissance). Although there are English-language maps for the attraction, the Fortress's scavenger hunt game is only presented in a Japanese booklet. Oh well. I really can't complain if that's the one thing in three parks that we couldn't do because we didn't know Japanese. OK, so occasionally there are confused moments or misunderstandings because you are almost completely surrounded by people who don't speak your language. The trade-off is that, because these Japanese parks see relatively few foreign visitors, many of the walk-around characters are as excited to take a picture with you as you are with them. Seriously. At the Disney parks, characters were all-too eager to goof (pun intended) around with us. Maybe it was because we were a little less reserved than the average Japanese visitor (although we saw some pretty excited guests during our time there) or maybe it was because we were a little extra thrilled to see characters that are not commonplace in the U.S. parks (Scrooge McDuck, Abu from "Aladdin," Bernard and Bianca from "The Rescuers," Max from "Goof Troop"). No matter – it's great to discover that a handshake, high-five or hug is the same in any language. Universal took it to a whole different level. Bert and Ernie, who had been taking pictures with guests separately, decided that they needed to both be in a picture with my wife and me. We didn't request this, but were happy to accept. Visitors who had to wait a little longer didn't get upset and politely offered to take our picture with the Sesame Street residents (and we gestured to do the same after our picture). Almost exactly the same thing happened with Charlie Brown and Lucy, although Lucy seemed less agreeable (not sure if she was in character or honestly annoyed with Chuck's insistent prodding). I can only imagine how much more boisterous the characters might become in the presence of an English-speaking kid, and not just us kids-at-heart. Regardless, the character interactions were bizarre, fantastic and unforgettable … which could describe the entirety of our experience as English speakers in Tokyo Disney Resort and Universal Studios Japan. All I can offer is a heartfelt "arigato gozaimasu." October 7, 2013 at 4:56 PM · Great article! I enjoyed reading every line of it and how the language barrier isn't always a huge burden in the Japanese parks. Glad you two had a wonderful time overseas! I hope to visit both USJ and TDR sometime in the next decade! October 7, 2013 at 6:40 PM · How were the crowds compared to the Florida versions of the parks? When my train got back, I decided to say something in Spanish back to the CMs in the load station (thanks, have a nice day, or something like that), and, of course, they looked at me as if I were speaking Martian. Good times. October 7, 2013 at 11:03 PM · I've traveled internationally multiple times for work and have never worried about the language barrier. Even though I only speak English, I've always been accompanied by work colleagues who spoke the local language natively. However, when contemplating a solo trip to a foreign theme park, my concerns over the language barrier go up exponentially. Thanks for the great article and demonstrating that with some basic planning and common sense, it can be done and still be enjoyable. October 8, 2013 at 5:09 AM · Glad you liked the article, guys! @Robert - Funny stuff. That reminds me of when we were in line for Raging Spirits. A group of Japanese teenagers in front of us were repeatedly using "Adios" as a greeting for anyone they saw and laughing themselves silly. October 8, 2013 at 7:38 AM · What a great article. I appreciate your insight and experiences. My wife and I have discussed such a trip and language was our biggest concern. I had found a video of the Jungle Cruise in English at Tokyo Disneyland on Youtube and thought maybe they did cruises in English. Perhaps that was just a special cruise that was recorded. October 8, 2013 at 11:43 AM · Having been lucky enough to visit all the big Florida theme parks, my daughter now lives in Japan near Tokyo and I think I should pay her a visit! I've not been too fussed about visiting Japan up to now, but Disney and Universal? Book me a flight! October 8, 2013 at 2:39 PM · Oooh! I just loved this column. I do not think I will ever be able to afford to go to Japan (certainly not until my kids are out of the house) so I kind of depend on columns like this to know what the Japanese parks are like. This column made me feel like I was there! Excellent writing and such a fun treat for the day. Write more about Japan please!!!! October 8, 2013 at 5:09 PM · This was an early Christmas gift. Thank you, it was incredibly helpful for me, who in the not too distant future will start planning a trip to these theme parks in Japan. I have learned more about these parks from your columns here on TPI than anywhere else. Now I know they speak Spanish in the Indy ride and in that surrounding area in DisneySea. Who knew?! As someone who speaks fluent Spanish, it sure is going to be crazy to hear Spanish in a Disney theme park in Japan! October 11, 2013 at 2:13 PM · great review! i went to tokyo disney and tokyo disneysea last year and i had a blast. the language barrier was no issue 99% of the time. everything described is on point with what i experienced. i have to say, these two parks were my favorite disney parks out of all the disney parks. the only parks i haven't been to are the two in paris. the tokyo parks were just so clean, everyone was so friendly, the children were so well behaved and the castmembers worked so well together to make sure the lines moved efficiently. i can't say the same for hk disney. on another note, i can speak cantonese so it was nice to be able to understand and experience hk disneyland in cantonese. i can't wait for shanghai disney. too bad i can't speak/understand mandarin. that should be an interesting theme park visit.